I am currently wearing the most ridiculous Christmas sweater you have ever seen and my car has a red nose and antlers affixed to it. My dog is wearing a Christmas bandana around his neck. My house is beautifully lit up inside and out with hundreds of white lights and we have two Christmas trees covered with ornaments. Under one of the trees, there are packages wrapped and ready to be opened by my precious family on Christmas morning. There is no doubt that it is Christmas. Yet, on the first Sunday of Advent, my father finally lost his battle, and I believe finally won the war, against the darkness that haunted him all his life. I sang Christmas carols and ate a wonderful meal today with my homeless friends who, in spite of the fact it is Christmas, will still sleep in the woods or a hypothermia shelter tonight, wondering what tomorrow will bring. Uncertainty about jobs and finances are keeping many of my friends awake at night wondering if they will have what they need to provide for their families in 2009. Even amidst the sparkling lights, there is still so much darkness left through which we must find our way. I have referred you to my blogging friend Milton's blog before. Tonight, I had some time to visit his blog and I was struck by this post about a service they had at their church this week. His wife Ginger is the pastor of their church and they had a service which he described in the following way: "Each of us entered and found a seat with room for the sorrow we had brought with us and we sang and prayed and talked about who and what had been lost this year. Tonight we had our Blue Christmas." I encourage you to read the whole post, but I was moved to tears when he recounted the lyrics to the song that he sang at the service. The whole post is beautiful and real and both broke my heart and mended it at the same time. Here is a video of the song he sang. The voice you hear in this video is the man who wrote it, Warren Zevon, before his death shortly afterwards. Milton ended his post with these words that rang so true for me..."We have all lost and we are found when we share the sorrow and keep each other close." You may remember WAY back last year that we were discussing that familiar verse in Isaiah that we hear every year at Christmas that speaks to us of the character of our coming, came, and coming back again Saviour. For "He will be called Wonderful Counselor, Mighty God, Everlasting Father, Prince of Peace." I took some time to explore the first three and had every intention of spending some time exploring the last one. In fact, I have to say that the last one is probably my favorite. Prince of Peace is probably the characteristic of Jesus that has been the most personally meaningful to me throughout the years that I have attempted to walk this path. Peace within my spirit is probably the "payoff," if you will, that keeps me coming back for more when the journey gets hard. So, here it is almost a month past Christmas and I am just now getting around to writing this last post on my "Christmas" themed series. What happened? Frankly, a distinct lack of peace in my life. A tutorial on what does NOT bring peace....just for the benefit of you, my dear readers. 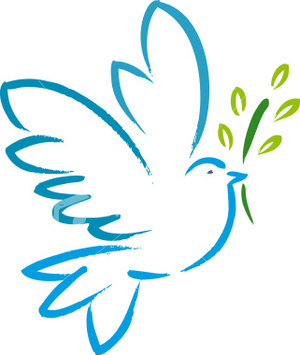 God, or more likely my own stubborn ego, decided that I would be much better suited to write about this topic AFTER I was reminded about some things I have learned over the years about peace, or the lack there of. I am exaggerating a bit for dramatic effect (what, me?) but it has been a bit of a rocky start to 2008 from the standpoint of peace and tranquility. Some of that has been external, some internal. First of all, the blasted health concerns have continued. The ongoing battle with the migraines have recently been complicated by a sinus infection that won't go away. Being that both of these issues take place from my neck up, it has been somewhat complicated from a medication standpoint...and my head just basically hurts all the time. To make the adventure more, ummm....adventurous....my doctor decided to switch my migraine prevention medication to one that has a daunting list of possible side effects. Even though I know better, I am goulishly drawn to the Internet to read the lists of all the things I might expect to go wrong, even though I can already recite them from memory. Worrying about my health and not feeling well AND not turning my worries over to God had brought about a deficit of peace in my life. Secondly, I recently got distracted from the things that are mine to do and that also brought about a decline of peace in my life for a period of time. I believe that God calls us to certain ministries, priorities, tasks, roles in our lives. All of us only have a certain number of hours in our days and, whether we like to admit it or not, we all have limited emotional, physical, and spiritual resources. When we spread ourselves too thin and get pulled emotionally into business that isn't ours, we are ineffective in the places that God has called us to do His work. Several years ago, I made some clear choices about the ministries for which God had called me and gifted me within our church, our community and our family and I had set what I believed were some really healthy boundaries to protect those. Through God's grace in teaching me that lesson, I had achieved some considerable peace based on those boundaries. Recently, I found myself getting pulled into some difficult emotional issues that weren't my business and worries that weren't mine to carry. I spent several weeks trying to fix things that weren't mine to fix. In the 12 step program, one of the definitions of insanity is working harder on the problem than the person with the problem. For me, it was a reminder of how important it is to be in contact every day with God about how He wants me to be using my time and energy. And a reminder of what a mess I get in when I go off and operate on my own without Him. When He is in charge, I have peace. When I am in charge, I don't have peace. Keep it simple, stupid. So, here is our Christmas lesson, boys and girls. The PRINCE part of Prince of Peace is really important. Peace is only found when we bend our knees to His authority. I have to remember to let Him be God. It is only when He is in charge, only when we allow Him to be the Prince of our life, that we find that peace that we so desparately seek. He wants to help us make each decision, He wants to help us set boundaries, He wants to comfort our worries and hold our hands when our head hurts. He wants to help us choose which battles to fight with Him by our side and remind us which battles belong to someone else altogether. And, although following Him down that path is sometimes frightening, there is great solace in knowing that He is in front of us leading the charge. Recently, I defended this song on another blog when the author and several of the commentors were poking fun at the simplistic nature of this particular Rich Mullins song. I said then that this song is a wonderful way to teach small children three of the most important attributes of our God...His wisdom, power and love...in a way that they do not soon forget. When I heard the song the other day on the radio, it made me think of our current discussion of the description of God found in Isaiah 9:6. The titles given to the promised Messiah mesh beautifully with these attributes: Wonderful Counselor speaks to His divine wisdom, Mighty God reminds us of His unmatched power, and Everlasting Father is the perfect picture of His eternal, personal love for each of us. Our youngest daughter sometimes poses "what if" questions to her dad and me. If she did _______, would we still love her? We tell her over and over that there is nothing that she could do that would ever cause us to stop loving her; we might feel angry or disappointed, but we would never stop loving her. Our love for her is not dependent on how well she does in school, whether she is nice to her sister or any other aspect of her behavior. We love her because she is ours to love forever. Nothing can separate us from the love of God...and that is a pretty tough looking list of potential obstacles. God loves us because He chooses to love us. God loves us because He IS love. I love the verse in 1John that says "How great is the love that the Father has lavished on us, that we should be called the children of God!" Lavishing love! Lavish means "characterized by or produced with extravagance and profusion" and "immoderate in giving or bestowing; unstinting." Our Everlasting Father chooses to bestow His love on us in an extravagant, profuse, immoderate and unstinting manner! One of the things that makes it so extravagant is that we can't earn it and we can't lose it. It is a gift from Him....a neverending, everlasting gift. God being bigger than the boogie man was important when they were 2 or 3. God being the biggest when they are taking an Algebra test or facing ugly peer pressure or having trouble going to sleep is more imortant at 11 or 14....or 43. The mightiness of God is the antidote to fear. Numerous times in scripture we hear God say to us "do not fear." The reason He can say that to us is because He is in control and there is no power in the universe greater than His. Mighty means "having or showing great power,skill, strength or force." It also means "imposing or awesome in size, degree or extent." God's power, strength and influence mean that we can rest in His embrace and turn our worry and fear over to Him. Even when we don't understand why, we can rest assured that He has it under control and His ways are always best. We can retire every day as the General Manager of the Universe because He already has that job and He is much better at it than we are anyway. "Is---is he a man?" asked Lucy. 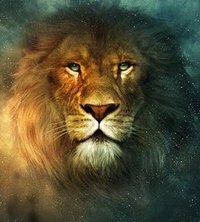 "Aslan a man!" said Mr. Beaver sternly. "Certainly not. I tell you he is the King of the wood and the son of the great Emperor-Beyond-the-Sea. Don't you know who is the King of Beasts? 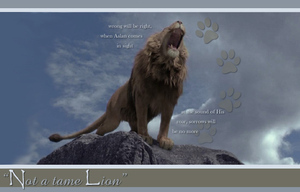 Aslan is a lion--the Lion, the great Lion." "Oooh," said Susan, "I thought he was a man. Is he---quite safe? I shall feel rather nervous about meeting a lion." Isn't that a perfect definition of our Mighty God...too powerful, too strong, too big to be entirely safe, but so very, very good. Aren't you glad you are on His side? These words from Isaiah are some of the most often read scriptures of Christmas. The advent devotionals that I am reading this year have both mentioned them at least once. I heard them again this morning at church. The last part, the potential titles of the predicted messiah, has particularly caught my attention today. As Christians, we believe that Jesus fulfilled these prophecies spoken so many years before by Isaiah. Collectively, we acknowledge Jesus as all of the above...Wonderful Counselor, Mighty God, Everlasting Father and Prince of Peace. Those are lofty titles, but what do they mean to me personally? If all those things were true of this baby born at Christmas, if all those things are still true today...what difference does it make in the way I live my life everyday? In the way I might live my life differently in the coming new year? The verse says "he will be called..." Do I call Him MY Wonderful Counselor, MY Mighty God, MY Everlasting Father, and MY Prince of Peace? So these are the thoughts that have been rattling around in my brain today, in between naps and football games...yes, I actually took two separate naps today! We don't have any company coming this year, the shopping is done, the packages are wrapped, so I am actually amazingly relaxed as we countdown the last few days before Christmas. What better way to spend these quiet days of Christmas than considering some of these questions. First, what does it mean for Jesus to be MY Wonderful Counselor? When I was reading this verse in the different translations, I noticed that some versions put a comma between the words wonderful and counselor. One of the translations used the word "amazing" instead of wonderful. Regardless of which way you read it, the word wonderful is certainly true of the God that I am trying to follow. The definition of wonderful says "capable of eliciting wonder, astonishing, excellent, admirable." Another says "so remarkable as to elicit disbelief." I read somewhere that the word that is translated as "wonderful" in some parts of the bible, is translated as "beyond understanding" in other places. Isaiah predicts a baby that will become an Extraordinary Strategist. Jesus is a Master Strategist, able to deliver his people from hopeless situations. Many of these situations are of our own making. Judah's was. He is a strategist who can handle situations that look hopeless to us. In this sense, Jesus is a "strategist" that is greater than we can even comprehend or understand. He is a strategist...a counselor, that specializes in situations that we can't handle on our own. Those times in my life when I didn't know where to turn, when I was confused or troubled or looking for answers, those are the times when I can experience Jesus as my wonderful counselor, if only I ask. As I seek His wisdom, the answer may come as that still small voice in my spirit, or in the wise words of a friend, or in the discovery of the perfect scripture for my situation, or maybe the strength to endure a situation where the answer is still unknown to me. With that wisdom...that answer...comes the incomprehensible realization that I am never alone. When Jesus finished His earthly ministry, He promised us the gift of the Holy Spirit...the Wonderful Counselor to whom we have access 24/7....if only we avail ourselves of that ministry. No matter how many years I walk this path, I am still amazed that the God of the Universe is interested in my problems and worries, the big ones and the small ones. And I am grateful that He is not only willing, but eager, to provide just the kind of Wise Counsel that I most need in any situation. A better plan, a winning strategy, an unexplainable strength. And because He actually got down off His throne in Heaven and became one of us, He understands what I experience as a human being in a fallen world. He's been there. Knowing these things, it amazes me how often I try to solve my problems by myself before it occurs to me to take the situation to God. I laugh when I realize that I have asked God's guidance about an issue I am dealing with in my volunteer work, but then attempted to solve a parenting issue with my own wisdom...maybe even in the same day! How often do I compartmentalize my life as God's business and MY business? How foolish to wrestle with life's challenges on my own when I have access to a better way. What do you call Him this Christmas? I mailed the annual Christmas cards on Thursday. Because my husband and I grew up in Texas, I primarily send cards out to family and friends who are far away and don't see us very often. In addition to those out-of-town loved ones, I send cards to people in the area whom we don't see on a day to day basis. Each day in December, I look forward to the trip to the mailbox where I will often find a card from a friend from high school or college. I love to see how their kids have grown and changed since last year's card. Sometimes I hold up the picture for Steve and have him guess which of our friends belong to these particular smiling cherubs. In this child born on Christmas, in the man he grew up to be, there is the power of God to bring light into our darkness, to make us whole, to give a new kind of life to anybody who turns toward Him in faith, even to such as you and me. …so what is left to us then is the greatest question of them all. How do we know whether or not this truth is true? How do we find out for ourselves whether in this child born so long ago there really is the power to give us a new kind of life in which both suffering and joy are immeasurably deepened, a new kind of life in which little by little we begin to be able to love even our friends, at moments maybe even our enemies, maybe at last even ourselves, even God? Adeste fidelis. That is the only answer I know for people who want to find out whether or not this true. Come all ye faithful, and all ye who would like to be faithful if only you could, all ye who walk in darkness and hunger for light. Have faith enough, hope enough, despair enough, foolishness enough at least to draw near to see for yourselves. Adeste fidelis. Come and behold Him, born the king of angels. Speak to Him or be silent before Him. In whatever way seems right to you and at whatever time, come to Him with your empty hands. The great promise is that to come to Him who was born at Bethlehem is to find coming to birth within ourselves something stronger and braver, gladder and kinder and holier, than ever we knew before or than ever we could have known without Him. Something stronger and braver, gladder and kinder and holier than we could ever know without Him...isn't that so true? Lost within the rush, hidden within the noise, those are the promises of Christmas for those who will come closer and see for themselves. As Psalm 34 tells us, we must "taste and see that the Lord is Good." Come and see for yourself! Saw this on one of my favorite blogs. These guys are awesome! Ok, ladies, this one is for you. You do not see any of the guys out there feeling guilt during the Christmas season....at least, I don't hear them talking about it with the guys over a beer after work. "Yea, Jim, I am really trying to make sure we find some balance this Christmas...teach the kids the true meaning of Christmas, while still giving them the over-the-top, magical Christmas of their dreams." "I know what you mean, Fred. I struggle this time of year to find the right charity to support, get everyone the special gift on their list and still stay within our financial means, decorate the house as extravagantly as our neighbors, and bake or make home-made gifts for the teachers, the coaches, the piano teachers, etc." Ladies, this one is solely our territory. And, if you are trying to live your life as a Christian light in a dark world, we often add an additional layer of guilt over the Christmas experience. We worry that we aren't doing Christmas "right." Here are a couple of my annual favorites...This will be the year that our family makes a homemade Advent wreath. We will then light a candle each Sunday of Advent while we read a lovely Advent devotional....yeah, well maybe next year. Ok then, this year we will remember the true meaning of the season by giving what we would have spent on each other to a worthy charity and only giving each other 3 gifts like the wise men...3 gifts, well maybe just 4...or 5. I've observed that many of us who profess to live for Christ 24/7/365 feel a need to overly "represent" during the holiday season. Whence the pressure? I would like to stake my claim here and say that we don't have to worry that no one will understand Christmas unless we continually reexplain it. The apostle Peter tells us to be ready to give an answer for the hope that is within us. This presumes that someone is asking about the hope the hope we possess. It's much better when someone asks about your faith; it means they actually want to know and are ready to listen because of some quality that emanates from Christ living in you; not because you have decorated with the most overtly "Christian" ornaments. Who on earth decided to embrace this pile of expectation and add yet another opportunity to feel like abject spiritual failures if we don't imbue every moment with meaning? Can I just peel that monkey off your back for a moment? I find it hard to believe that Jesus is seated at the right hand of the Father getting all bothered that we aren't meeting some unwritten standard of properly celebrating the season. Note: it is spiritual by virtue of whose birth it is we are celebrating. If you want to express your love for your family with extravagant gifts and you can afford to do so, then by all means lavish them as the Father lavished us with the gift of His son and as wise men brought extravagant gifts from afar. If you want to feast with your friends and family to celebrate the gift that they are in your life, go for it! If your heart of compassion compels you to take up your proverbial towel and serve, then go forth to the homeless shelter, serve dinner and distribute gifts of clothing and blankets. Should you choose to purchase no presents and give your money to fund an endeavor that engages your passion, give with all your heart! If you want to invite your neighbors over and extend to them the gift of hospitality, do so with gusto! If you want to bake cookies with your children and smear icing all over your noses and laugh until you cry, do it---and don't worry that your activities are not "spiritual" enough. That kind of thinking only kills the very joy and freedom that Christ came to give us. If Christ lives in you 365 days a year, you don't have to be any more "Christian" during the Christmas season. In fact, it is impossible to pull off. More thoughts later on enjoying Christmas. Ladies, everyone take a deep breath...we will get through this! It has been a busy, wonderful week and joyful, relaxing day. Christmas has arrived! It is late and I am headed to bed, but I wanted to say Merry Christmas to all of you who share your lives with me by visiting my blog. God bless you! Immanuel, God with us, born in us, abiding in us...the Light of the world casting out the darkness of our despair. Not just today, but every day that we invite Him to abide in us. What a gift! Amen and Amen! 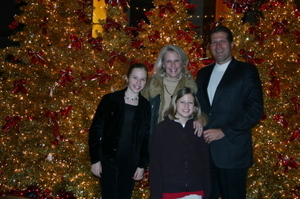 From my family to yours, I wish you a Merry, Merry Christmas! When I began this blog in September of 2005, I explained why I had chosen the name Seeking Him and the verse that I have at the top of the page. Last Christmas, my mom made me the pillow that I have pictured here. I still find these words from Jeremiah to be some of my favorite of God's promises to us. "You will seek me and find me, when you seek me with all your heart." 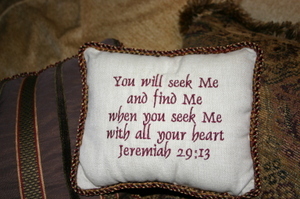 Seeking Him is always within His will for us. When we pray to find Him, He always answers YES! Isn't Christmas all about a renewed seeking of His presence? From that day forward, this Scripture has been a solid rock at the core of my faith. It speaks to a God of passionate involvement, a God whose promise is unflagging, a God who will not hide from a wholehearted seeker, a God who does not require specific words or specific rituals, a God who requires simply nothing more or less than our whole hearts. That same God who called to Mary and called to Joseph, that same God who calls to us each and every waiting day of Advent, promises that as long as we seek with our hearts we shall find. No doubts and no exceptions. Just our whole hearts...nothing more and nothing less. My phone rang unexpectantly at 7:15 in the morning earlier this week. Although some of us are up, we rarely get calls that early. It was my sister calling to wish my daughter a happy birthday. She said that she wanted to make sure she caught my daughter before she left for school that morning, so she had left herself a reminder. She reminded herself to call first thing in the morning by leaving a shoe in her kitchen sink the night before. While I have heard of tying a string around your finger, this one was definitely new to me! 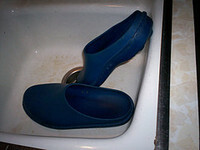 What in the world would shoes in the sink have to do with remembering to make a phone call? Her strategy was this: when she walked in the kitchen to start breakfast for her kids, she would immediately notice that there was a shoe in the sink. Since that is not generally where they keep their shoes, she would then think to herself...perhaps even ask herself out loud..."why in the world is there a shoe in my sink?" At this point, even in her sleepy state, she would remember that she wanted to call her niece to say Happy Birthday first thing in the morning. Ta da! A perfect plan that achieved its intended goals! The beauty of this plan is in the power of the unexpected. She did not expect to see a shoe in her sink when she entered her kitchen. This was not the usual place for shoes. In fact, it was a very silly place for a shoe to be. This unexpected discovery got her attention. Had there not been a shoe in her sink, she would have probably gone about her usual morning routine and forgotten her desire to do something different that morning. How often does God put a "shoe in our sink" to get our attention? What sort of unexpected things does He send our way in order to refocus our attention away from the mundane, the usual, the routine? How often do we miss His presence altogether because He came in a way that we weren't expecting? I think we often go through our daily routine and never notice the ways God is working around us. We limit our experience of God's interventions in our life to the ways that we have seen Him work in the past. By limiting our perception of who God is, we make Him safe and manageable. A safe and manageable God is much easier to dismiss, or at least to relegate to a place of lesser importance in our lives. That first Christmas, God came in a very unexpected way. When the shepherds got up that morning, I suspect they never anticipated the angel chorus to come. When Mary felt those first pangs of labor, I imagine she never expected to give birth in a stable a few short hours later. The world wasn't looking for a God that would humble Himself in such a way. The Jewish people were expecting an altogether different kind of Messiah. Jesus continually said things that challenged the status quo; who ever heard of a Servant King? What kind of God are you expecting this Christmas? Will we know Him when He comes? Are we willing to open our hearts to the possibility of a bigger God than we ever imagined? Are we brave enough to watch for a God that isn't safe, but who is definitely good? A God who is different than we expected, better than we expected, more than we expected...the Kings of Kings! Advent devotionals often have at least one entry comparing the experience of pregnancy with our anticipation of the Christmas birth. The excitement, the longing, the seemingly endless waiting for that which we desire more than anything. 13 years ago, I experienced an Advent season that coincided with a real life pregnancy. 13 years ago today, I experienced the birth of my first born. My beautiful Christmas baby has recently transformed before my eyes into a young woman. It happened so fast! The picture here shows her in a recent Nutcracker performance. I remember her first Christmas Eve with us. We took her to the candlelight service, one of her first outings at only 2 weeks old. I remember thinking that the whole world looked different and I couldn't believe everyone else didn't notice this miracle that had happened. Her birth had transformed me into a mother, Steve into a father...the couple that we were before had become a family. On the night of the 25th that year, on Christmas night, it snowed a magical silent snow and I remember thinking that the world was completely perfect and pure and perhaps even holy. Now she is a teenager. Although our society often follows that announcement with a groan, I feel just the opposite. I feel nothing but anticipation and joy at this next phase of our journey together. I am in awe of the magnificient human being that she is and that she is becoming. I admire her faith, her intelligence, her integrity, her gentleness and her courage. Although I am quite certain that I am biased, I also think she is spectacularly beautiful. While I know that we may face the normal drama of the teen years, I also know that we have a special connection that will enable us to get through the expected mother-daughter challenges. In addition to being mother and daughter, we are sisters in Christ. We are both in process, we are both becoming, we are both growing into the vision that God has for us. I learn from her everyday, as I hope she learns from me. She patiently taught me how to be a mom, when I was terrified that I would do it wrong. God knew just the gentle spirit to send me for my first born and I am overwhelmed with gratitude for the privilege of having her in my life. Happy Birthday, baby. I love you more than I can express in words. It is amazing to think that God feels this way about all of us, only even bigger and stronger. I absolutely love the Advent hymn "O Come, O Come Emmanuel." The haunting minor melody gives voice to the longing reflected in the lyrics. If you haven't grown up in a tradition that sings this song every year, you have to hear the melody to understand what I mean. This link will take you to a beautiful rendition of the song, including some lovely graphics. When I looked online for a copy of the lyrics, I found many different versions. It seems that there are at least seven different verses. I wonder which are the originals and which have been written in more recent times. Here is one version that had three of my favorite verses, including the best known first verse. We no longer have to yearn for a Messiah. As Christians, we believe that our prayers for deliverance were answered on that first Christmas. Rejoice, Rejoice! Immanuel HAS already come to thee!! While we may sing this song this Sunday, we are likely to also sing "Hark the Herald Angels Sing" or "Joy to the World"...songs that celebrate His arrival among us. Our longing for a Saviour is no longer, for He has come. For unto us a Child is born. Yet, longing and yearning are still words to which we feel a connection. I still hear the haunting melody of this song and recognize the feeling which it evokes. For what do we long? As Christians who have already met this Son of God, this Newborn King, for what are we waiting this Advent? I think it has something to do with the second two verses that I have copied above. I think we are longing for the wisdom, order, knowledge, unity and peace of which those verses speak. We long for those things individually and collectively. We long for the "thy Kingdom come" part...the "on earth as it is in heaven" part. Christ was born in Bethlehem on Christmas, but He is still being born in us continually. Our salvation, our deliverance is already...but not quite yet. We who are hoping to be transformed, recognize that we have a long way to go. The world we see around us does not fit with the vision we believe God has for the world. And so, even as we Rejoice, we long for that which is still to come...a deeper understanding and manifestation of Immanuel, God With Us. "We, too, are delivered, even as we wait for deliverance. Our days stack up like rocks for an altar, calling us to look into the guts of our lives for God’s presence rather than staring up at the sky for some sort of grand gesture." Advent has begun! Advent is traditionally a time of preparation...in this case, preparation for the coming birth of our Messiah. How do we as Christians prepare, once again, for this holy day? What do we do to prepare our hearts, prepare our homes, prepare our lives, prepare our families for this holy celebration? A time of preparation...what does it mean to prepare? Here is a pretty simple definition: "to make things or oneself ready beforehand for a specific purpose, as for an event or occasion...to equip in advance." When I prepare for a trip, for instance, I generally start by making a list of all the things I need to do and all the things I need to pack. Then, as I go through my preparations, I check things off my list. Very systematic and orderly. As I prepare for Christmas, I find that I use a similar approach. "I'm making a list, checking it twice..." Gifts to buy, events to attend, songs to rehearse, traditions to remember....put up the lights, get out the decorations, trim the tree, deliver the basket. My to-do list is full of things I love to do...buy gifts for other people, decorate our home with sparkly lights, learn Christmas music to perform at church, attend my children's performances, plan get-togethers with people I love. Every one of those things speaks right to my heart...time spent with loved ones, making our home a sanctuary, enjoying and performing music, worshipping and serving with my church family. All good stuff, right? The only problem is that all that busyness may serve to disconnect me from the reason that we celebrate. How do I, how do we, stay conncected to the Source of our Joy amidst the preparations? Perhaps, in spite of the preparations? How do we get to December 26th and not have any regrets about the way we spent the month of December? The Coming of God is not something we can handle or absorb. It is impossible!! It is exactly the kind of thing that blows us off our perches and takes us to places that we would never have thought of going. Thanks be to God! This really resonated with me. I have spent so many Advents with good intentions of "doing it right." Daily devotions and bible readings, quiet reflections on the meaning of the Nativity, lovely entries in my journal reflecting the profound insights that I have experienced from God....yeah, right!! Then, because it doesn't quite happen that way, I have a vague sense of discontent on the 26th that I somehow failed to experience the Christmas of my expectations...that I somehow "missed" it. Don't get me wrong, disciplines such as these are wonderful and I treasure the times during December when I have the opportunity to experience those kinds of quiet moments. But, I am coming to understand that these types of expectations for Advent really just put that focus back on me (instead of God)...what am I doing to orchestrate, manufacture, invoke a Christmas "moment?" Just like the perfect Christmas morning I try to create for my children, am I trying to "birth" Christ in me through my own busyness...my own preparations...my own efforts? Maybe God doesn't need me to orchestrate the message He has for me this Christmas. Maybe God has a plan for which He doesn't need my help. Maybe my part is to grab those quiet moments when I can, but to realize that God is equally present in those wilder, louder, crazier, busier moments. Perhaps we should prayerfully remain open and surrendered to the serendipitous gifts of Presence we may experience through no efforts of our own, if only we are watching for Him. Perhaps we might all be better served by letting go of our expectations of how we should "do" Christmas and expectantly wait for God to show us how He "does" Christmas. I am finding that, when I let go of my preconceived notions of who God is and what He can do, He shows Himself to be bigger and better than I could even imagine. The first Christmas certainly shows us that He is a God that defies conventional expectations!! God, who arrives in places and times we could never anticipate, thank you. We don't want to "handle" You; we want to welcome You into our heart and lives. Show us where to find the courage to abandon those hopes of being ready and help us instead to empty ourselves. May we be filled, when You do arrive, with joy and singing and sharing so fantastic that even the cynics will not be able to resist You. Amen. Come, Lord Jesus, come. I am watching and waiting to see Your glory this Christmas. I can't wait to see what You have planned! I've gotten this "letter" by email several times and received it again today from my friend, Ed. I love it! It has come to my attention that many of you are upset that folks are taking my name out of the season. Maybe you've forgotten that I wasn't actually born during this time of the year and that it was some of your predecessors who decided to celebrate my birthday on what was actually a time of a pagan festival, although I do appreciate being remembered anytime. How I personally feel about this celebration can probably be most easily understood by those of you who have been blessed with children of your own. I don't care what you call the day. If you want to celebrate my birth just GET ALONG AND LOVE ONE ANOTHER. Now, having said that let me go on. If it bothers you that the town in which you live doesn't allow a scene depicting My birth, then just get rid of a couple of Santa's and snowmen and put in a small Nativity scene on your own front lawn. If all my followers did that, there wouldn't be any need for such a scene on the town square because there would be so many of them all around town. Stop worrying about the fact that people are calling the tree a holiday tree, instead of a Christmas tree. It was I who made all trees. You can and may remember me anytime you see any tree. Decorate a grape vine if you wish: I actually spoke of that one in a teaching explaining who I am in relation to you and what each of our tasks are. If you have forgotten that one, look up John 15: 1 - 8. 3. Instead of writing the President complaining about the wording on the cards his staff sent out this year, why don't you write and tell him that you'll be praying for him and his family this year. Then follow up. It will be nice hearing your prayers again. 6. Did you know that someone in your town will attempt to take their own life this season because they feel so alone and hopeless? Since you don't know who that person is, try giving everyone you meet a warm smile. It could make the difference. Also, you might consider supporting the local suicide hot-line: they talk with people like that every day. 7. Instead of nit picking about what the retailer in your town calls the holiday, be patient with the people who work there. Give them a warm smile and a kind word. Even if they aren't allowed to wish you a "Merry Christmas," that doesn't keep you from wishing them one. Then stop shopping there on Sunday. If the store didn't make so much money on that day, they'd close and let their employees spend the day at home and in church with their families. P.S Don't forget; I am God and can take care of Myself. Just love Me and do what I have told you to do. I'll take care of all the rest. Check out the list above and get to work; time is short. I'll help you, but the ball is now in your court. And do have a most blessed Christmas with all those whom you love. Remember, Jesus had the birthday, but you got the Gift.